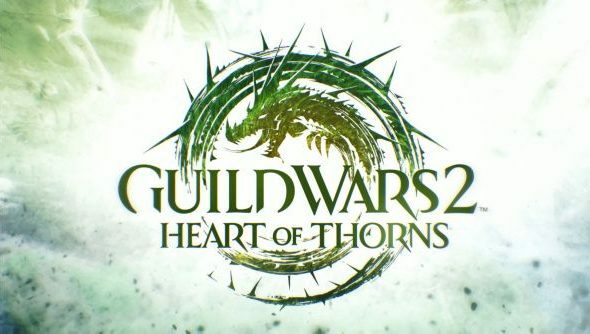 Today at PAX South, ArenaNet have officially revealed the first Guild Wars 2 expansion: Heart of Thorns. Continuing with the Living Story, players will pursue Tyria’s latest threat, a dragon named Mordremoth, into the heart of Maguuma Jungle. The expansion includes new zones, NPC races, skill and class combinations and more additions to the various PVP modes. It will also feature no new level cap, instead keeping the theme of “no gear treadmill”. A new profession will also be making its way, dubbed the Revenant, which will use heavy armour and magical abilities channeled from the mists. To celebrate the announcement, ArenaNet have also slashed the price of the digital version of Guild Wars 2 by 75%, at least until 11:59 PM PST tomorrow. Guild Wars 2: Heart of Thorns will introduce a new PVE progression system, named “Masteries”, which will allow players to train unique skills to be used within in Maguuma Jungle. Whenever players complete challenges such as bosses, achievements and entire zones, they will acquire mastery points. These can then be exchanged to unlock new skills, which will be available across all of an accounts characters. Skills include a new hang glider, understand new languages, crafting (including legendary precursors) and dozens of combat abilities. Players will also be able to customise their professions (classes), including new specialisations. Rangers for example can train to become a Druid, and use staves, new skills, and profession mechanics. Necromancers will be able to use Greatswords too. More specialisations will be announced between now, and the launch of the expansion. Heart of Thorns will also introduce a new profession: the Revenant. They will wear heavy armour, and wield magical abilities from deep within the mists. Using this power, they can invoke legends of Guild Wars past, to empower them and their weapons. World vs World, Guild Wars 2’s epic triple server threat PVP mode, is also receiving some new additions. ArenaNet want to employ RTS mechanics in a new borderland map, with its own distinct theme. Holding objectives will have a more profound effect on the battlefield e.g. holding the Earth Keep will raise the ground to help defend players, and the Fire Keep will summon magma pools to help players traverse across the map more quickly. Scaling down to the smaller, but equally competitive PVP modes, ArenaNet will be adding a new mode called “Stronghold”. Teams will fight over supplies, which can be spent to summon NPC units to lay siege to the enemies base. But the biggest news by far is the long awaited addition of Guild Halls and GVG. Guilds will have the ability to acquire new Guild Halls for their members to hang out in, and also compete in epic Guild vs Guild battles; iconic of the original game. You can check out more information on the official expansion website. A launch date has still yet to be disclosed.